It is a sunny but windy morning in the Nepali village of Samzong, and several women have gathered around the only working water tap in the area, taking turns washing clothes and dishes in the stream of cold water. While most of Samzong lies deserted and the wind howls eerily around the small houses, peals of merry laughter spring from the small group. As midday approaches, more women approach carrying an assortment of empty buckets and containers which they line up neatly around the tap. 18-year-old Nima Gurung is one of them. As her turn comes, she quickly fills her laundry bucket with water and carefully moves it aside to let the others behind her use the tap. “There is not enough water in this village. Since this is the only water tap working here, everyone has to take turns for the water,” says Nima, who lives in Samzong. Nestled below arid cliffs near the Nepal-China border, Samzong is among a handful of remote villages in Upper Mustang that are facing an acute water crisis caused by erratic rainfall and snowmelt. Situated in the rain shadow of the Himalayas, the region receives less than 200mm of rain per year and the lack of rainfall has reduced the nearby river to a trickle and turned acres of farmlands into a barren wasteland. This water crisis has been particularly devastating for women. Like in most rural areas of Nepal and around South Asia, it is them who are in charge of household activities. Most are involved in farming as a means to secure their livelihoods and, as a consequence, are heavily dependent on water. With water taps drying up, women are bearing the brunt of the consequences of climate change. “It used to be easier when we had two water taps because there would be enough water for people to finish their chores. Since the other one dried up a few days back, it has been a hassle to come all the way to the middle of the village for water,” says Karsang Gurung, of the Aama Samuha, or mother’s group, in Yara. She adds that productivity has also been hampered because of the lack of rainfall. Whereas previously wheat, buckwheat and mustard could be harvested twice a year, wheat is the only crop growing now. With water scarce, farmlands continue to deplete and even growing one variety of crop has become a challenge since the fields get dry before it is time to harvest. “Because of the lack of rainfall, it is either difficult to grow most of the crops or the crops are heavily infested with insects during the summer months,” says Karsang. But lack of rainfall is not the only problem. Sometimes there is torrential rain for days and sometimes there is no rain at all. “When it rains heavily, the water enters our homes and submerges everything. It even washes away irrigation canals that bring in water for the fields, destroying the yield of crops,” says Nima Gurung of Samzong. And, since most of these villages are remote, materials to repair irrigation canals or dried up water taps cannot be easily obtained. Making things worse, women lack the technical know-how to repair these taps and pipes, so that even small, easily fixable issues quickly morph into enormous problems for an entire village. 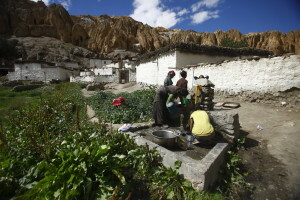 Unlike Samzong, Yara is accessible by road and is a favourite stopover for trekkers who visit Upper Mustang. Yet the water crisis has made it difficult for locals to support their small tourist businesses. “Women are the ones who are most affected since we are the ones who do all the household work. We need to cook food, wash our dishes and wash our clothes. When trekkers come stay at our lodge, we need to clean the sheets. If we don’t have water, we have to let it be, which is very embarrassing. When there is no water, we cannot wash our dishes. It does not feel clean,” says Karsang. Although both the villages have employed a turn-by-turn system, water scarcity has been a source of conflict within these tight-knit communities. “We usually have discussions in our community regarding the unfair use of water. There are instances when people have used excessive water to irrigate their fields when other families do not even have drinking water,” says Karsang. Although Yara has a system in place which allows each household a full day to irrigate their fields, there are cases of misuse. With her husband and children living in Pokhara, Karsang needs to look after her mother-in-law in addition to all the household chores. And she is not the only one. An increasing number of men have left their villages, such as Yara and Samzong, for better employment opportunities in other parts of Nepal. With no men around, many women now have sole responsibility for their household’s survival, taking care of their families, from elderly parents to infants, as well as tending to the livestock and village affairs. A number of villages such as Samzong are completely run by women. 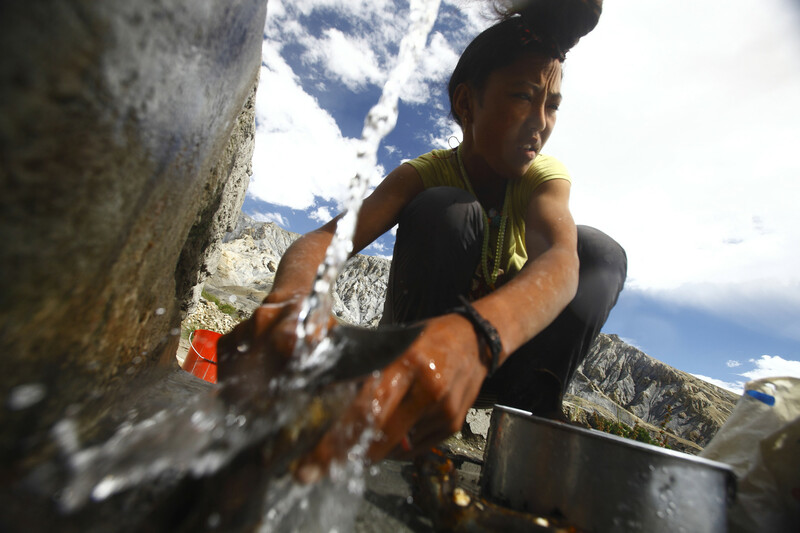 The water crisis in the northern regions of Nepal is taking an unprecedented toll on women. As the country recovers from decades of civil war and a devastating earthquake, it is imperative that women be included as stakeholders in any and all decisions on how to tackle the biggest challenge the small country may yet face: the existential threat of climate change.